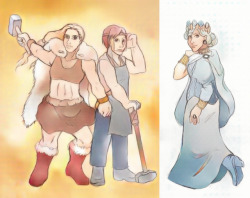 Hey, if you like webcomics, and you like children having enough to eat, check out this zine! 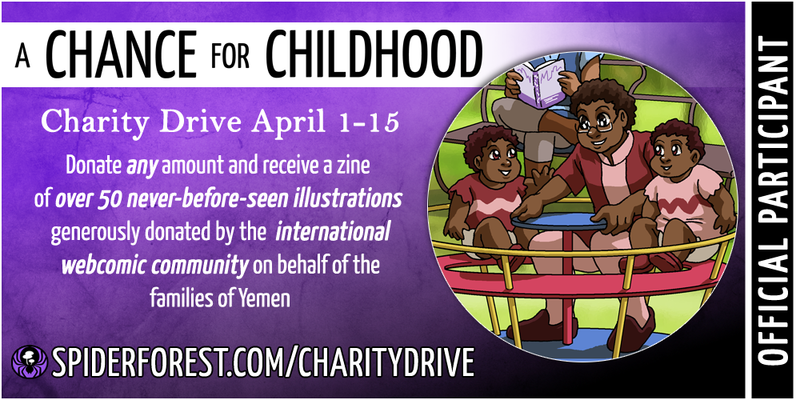 It has never-before-seen illustrations from 50+ comics, including Leif & Thorn — and you get it by donating to fight the famine in Yemen. Cedar: Do you need more from me? I’m supposed to be at a celebrity charity dinner this evening. Raising funds to save the Pink Spotted Owlgull. M. Raifort: No, I think we’ve seen enough. Cedar: Thanks! It usually is!
. . . and they said I’d get a report on my powers in about two weeks! Those used to get finished faster . . .
. . . but I guess now it goes through some new, extra-detailed screening system. Okay, I’m just gonna ask here, what exactly is endangering the bird? I’m guessing habitat loss due to some form of climate change, rather than overhunting. At this point, we have heard both Ceannic taxpayer money and private donations are going into efforts to save the Pink-Spotted Owlgull at this point. This suggests to me that they need investment into defense and bolstering remaining habitat, rather than additional funding for wildlife rangers to keep poachers from plying their odious trade. It’s possible they are not sure yet either and are still trying to find out. Dramatic irony. The “extra-detailed screening system” is, unbeknownst to Cedar, right there in the room listening to him.